Product prices and availability are accurate as of 2019-04-19 21:10:26 CDT and are subject to change. Any price and availability information displayed on http://www.amazon.com/ at the time of purchase will apply to the purchase of this product. Communicate over up to 16 miles with a pair of these 2-way radios from Uniden. Each radio features 22 channels, full channel scan, "roger" beep tone and keypad lock. The set comes in with a user guide, belt clip and batteries for added convenience. 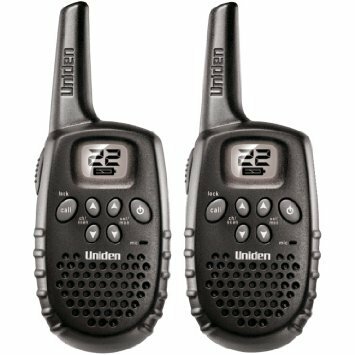 22 channels, including 7 FRS and 15 GMRS channels Call tone will sound when calling each other Scan helps you find others in your area Roger beep lets others know when you finish speaking Packaging is 100% recyclable and is printed with non-toxic inks. The Uniden manufacturing standards restrict the use of hazardous chemicals.